My brother hosts Thanksgiving dinner each year. It’s one of the best parties of the holiday season and it’s a meal I look forward to eagerly. You see, he’s got it down to a science. While he and my sister-in-law take care of the main stays of the meal: two turkeys (one roasted, one fried), stuffing, corn, and several top notch bottles of wine, the guests are asked to bring their own specialties. My sister-in-law’s sister brings a carrot souffle that I cannot get enough of. My mom brings her famous candied yams. My brother-in-law makes about ten different types of pie. And we’ve been doing this for enough years that the kinks in all these dishes have been worked out. We are a well oiled machine. Me, I’m in charge of the potatoes. I bring two potato gratins that are decadently delicious. A family favorite is the one I make with cheddar and our house-roasted New Mexico green chiles. 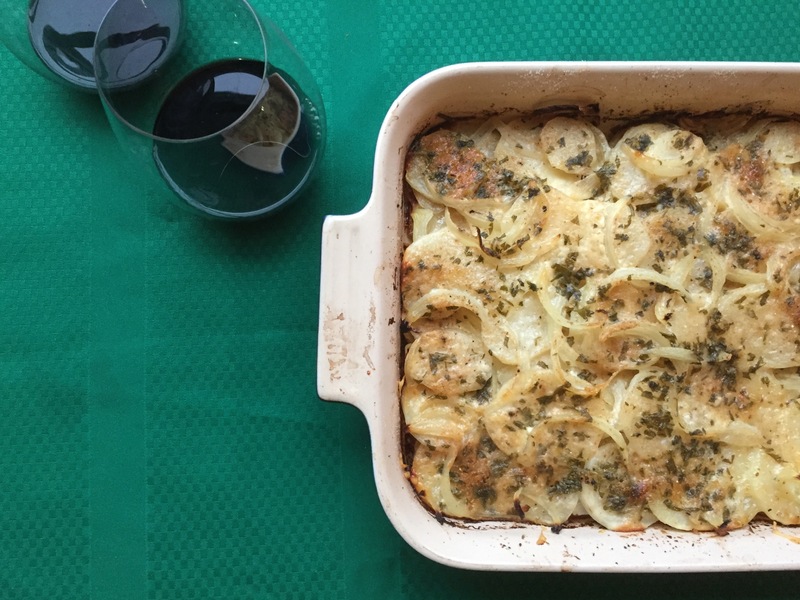 But this recipe represents the basic building blocks for the perfect gratin, no matter how you end up layering in other flavors (or if you even choose to do so – it’s perfectly yummy just like this). Surprisingly, the key ingredient here is the lemon juice. It provides just the right foil to the creamy richness of the cheeses, heavy cream, and the potatoes themselves. That little hit of acidic brightness on the mouth helps to lighten the whole dish. To add other flavors simply switch out the cheeses or sprinkle over different herbs. Make things easy on yourself and prepare this the day before. Then just heat it up, covered, on the day. I sure do hope your Thanksgiving is as tasty as I’m anticipating mine will be. And while we’re on the topic of Thanksgiving, thank you so much for checking out my blog this year. I really appreciate it. Preheat the oven to 425°F. Grease a 9 x 13-inch casserole dish with cooking spray. In a medium bowl, combine 1/2 cup of the Parmesan with the Gruyere. Layer a third of the potato slices over the base of the casserole dish; sprinkle over a third of the onion and a third of the cheese mixture. Pour over a third of the lemon juice and season generously but to taste with the salt and pepper. Repeat with the remaining potato, onion, cheese mixture, and lemon juice. Season each layer with the salt and pepper. Pour over the cream. In a small bowl, combine the remaining 1/4 cup Parmesan with the breadcrumbs and parsley. Sprinkle this mixture all over the top of the casserole, then dot with the chopped butter. Bake, covered, about 1 hour or until the potato is tender. Uncover and bake another 10 minutes or until lightly browned. *Peel and slice the potatoes only after you have prepared the rest of the gratin ingredients. You want to avoid leaving the peeled potatoes out so that they don’t brown. This entry was posted in side and tagged casserole, cheese, gratin, potato, side dish, Thanksgiving side. Bookmark the permalink. Hi, Nancy! I hope you guys had a fabulous Thanksgiving. I made this for our feast. Very good!! Thank you! !